Subtle reconfigurations of the veil become signifiers of political ideology early on in Persepolis, establishing a link between clothing and political identity. 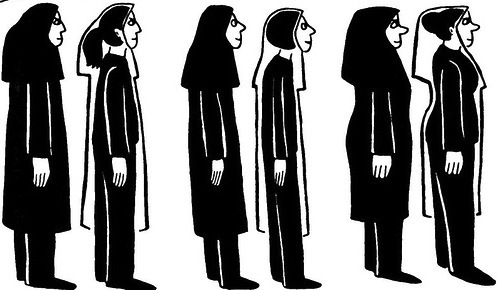 Personal identity also becomes linked to clothing later on in Persepolis when Marjane “tries on” different identities through clothing, and represents her own fractured identity and the fractured identities of other women in Iran through visual repetition of the female body. Identity is linked to clothing in Marjane’s attempts to assimilate to European culture. 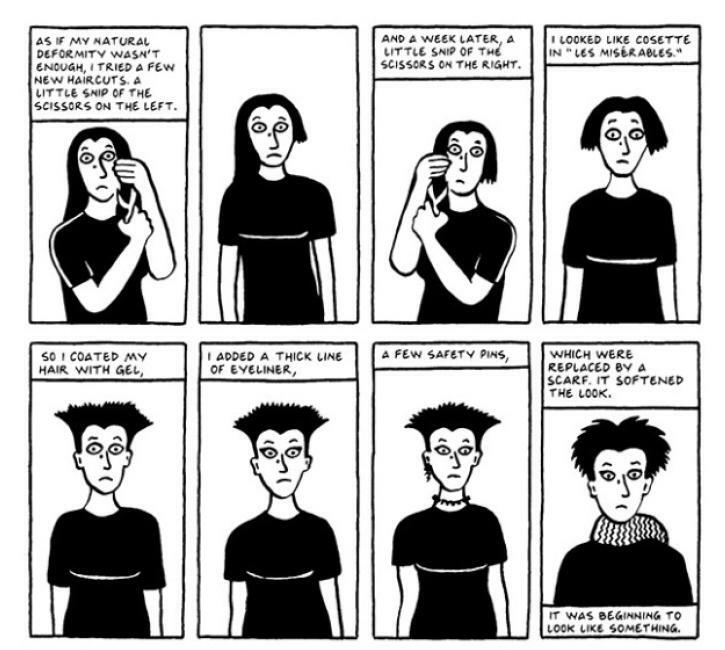 A series of panels presents Marjane’s body repeated eight times with only slight variations while she tries on different hairstyles and accessories in an attempt to transform herself and fit in with her new group of “punk” friends. This rebellious look also expresses resistance to mainstream society. Marjane’s friends respond positively to her transformation; at the bottom of the page Julie says “Have you seen how beautiful she is now?” (190). Just as in Iran, where although particular clothing is prescribed, identity can be expressed externally through subtle markers of resistance, identity in Europe is closely linked to clothing styles and the body. With her new look, Marjane is established as part of a “marginalized” group, drawn more closely into her circle of friends, and thus finds it easier to assimilate, at least superficially. This shifting identity is shown clearly within the narrative a few pages later, as Marjane betrays her previous stance against drugs in further attempts to assimilate. Jennifer Worth argues that even in Austria, Marjane “hides herself under a succession of various symbolic ‘veils,’ cloaking herself beneath different physically distinct manifestations, none of which bring her the satisfaction of subjecthood” (155). By repeating her image across the page as Marjane tries on a new identity, Satrapi represents Marjane’s identity in exile as being still unresolved and perhaps unresolvable as she tries to both assimilate and resist the mainstream through her “punk” style. Similarly, back in Iran, Satrapi represents the female body as persisting despite the oppression signified by the veil, but she also suggests that women’s identities are fractured and fragmented by the oppressive regime. In one panel she explains that “with practice, even though they were covered from head to foot, you got to the point where you could guess their shape, the way they wore their hair, and even their political opinions” (Satrapi 294). The image beneath this text depicts three women with their figures doubled; the first figure of each woman is her body veiled, the second with the veil reduced to an outline, revealing the (still clothed) body beneath. That these women each have two bodies on the page suggests a fractured identity in that their public, veiled selves are distinct from their private, individual selves. This effect of doubling bodies appears again a few pages later, when two images, composed like group photos, are compared in the space of a single page: one of Marjane and her friends wearing veils and standing stiffly, the other of them unveiled, with a variety of hairstyles and clothings in more relaxed poses. The text on this page explains that the “disparity” between their public and private lives “made [them] schizophrenic” (305) and the visual arrangement reinforces this by presenting their bodies as doubled. The assymetrical arrangement of bodies in the top and bottom images also suggests the unresolvability of these identities, as they cannot be visually merged. This depiction of women’s identities (via their bodies) being split engages in the slippery relationship to Western feminism and liberalism that characterizes Persepolis. While on the one hand, this image suggests that Iranian women are oppressed by the regime, it also presents a “slippage” from this stereotypical western viewpoint as Satrapi also represents herself and these women as embodied subjects capable of resisting the regime by the very act of creating these fractured identities through resistance and rebellion. Also, Marjane’s identity is shown to be equally unresolvable in Vienna, creating a representation of life in exile being as fraught as life within repressive Iran, countering any notions that Westernization offers easy liberation. Satrapi seems to be suggesting that both socially prescribed and rebellious or resistant identities are acted out on the body, but that the necessarily performative nature of such identities – the ease with which they can be put on or taken off – means they are contradictory, fragmenting, and ever-changing.